The V222 Vox Mark VI "Teardrop"
Soon after Vox entered the guitar marketplace with student grade models in 1961, their development of professional level instruments commenced. Vox determined that "copy cat" guitar designs for their professional models would be unacceptable. Their new professional guitar models would need to have body designs that were unique and iconic, making them immdiately recognizable as a Vox instrument. To help accomplish this styling goal, Vox entered into a contract with the London Design Centre in 1962 to suggest guitar body shapes. The result of this initial effort was the "coffin" shaped Phantom VI guitar. On the heels of the introduction of the Phantom VI, a new solid body "teardrop" shaped guitar was developed at Vox. This new guitar had the same "Stratocaster" inspired triple single coil pickup arrangement that Vox used on the Phantom VI. It also used the same bridge, vibrato arm and Eko manufactured "paddle head stock" neck as the Phantom VI. The Phantom had a three position rotary pickup switch, the Teardrop used a three position toggle. Vox named this new "teardrop" model the "Phantom Mark VI" guitar when it was introduced in 1963. Before long, the Phantom name was dropped on the teardrop model to avoid confusion with the original Phantom VI. The teardrop was simply renamed the "Mark VI". Vox expanded the "teardrop" line to include the V252 Mark VI "thin line" electro acoustic guitar, the V231 Mark IX nine string guitar, the V223 Mark XII twelve string guitar, the V224 Mark IV bass guitar and the V248 Wyman bass. A white two pickup Mark VI model was designed for Brian Jones of the Rolling Stones, but oddly was not offered commercially by Vox in the 1960s. The "Mark" series guitars and basses had the largest commercial success of all Vox guitars produced during the British Invasion. By 1965, the popularity and world wide demand for Vox guitars caused JMI to supplement UK production at Eko in Italy. The Vox Mark VI guitar was first offered to the US market in the 1966 "Vox, It's Whats Happening - Beatles Cover" catalog. A black and white reprint of this catalog is available from North Coast Music. 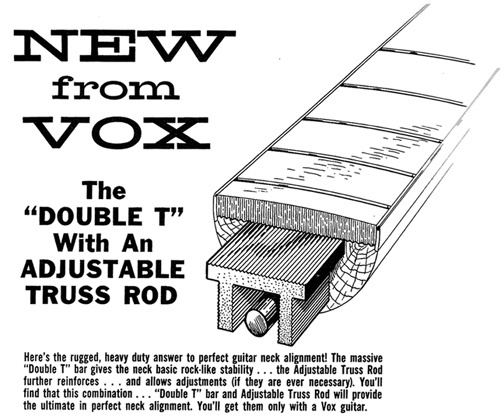 The 1966 US Vox catalog described the V222 Mark VI guitar as follows: "Exclusive teardrop design; detachable padded cushion on back; exclusive 2-way string damper; quick-flick 3 position pick-up switch; vibrato; sunburst or popular colors." 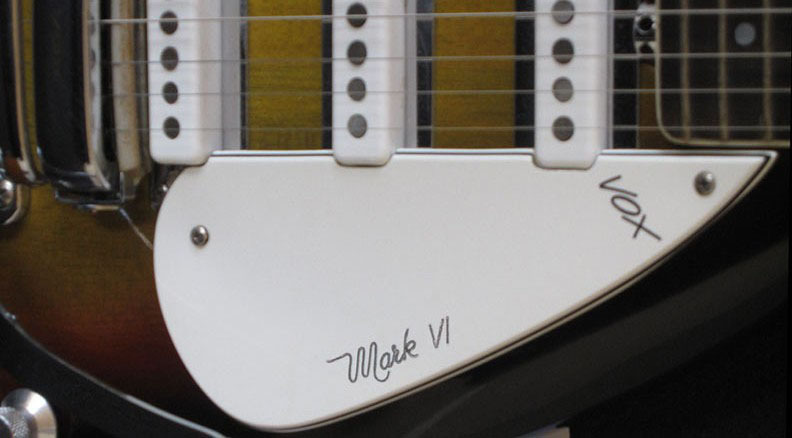 Like a Fender Stratocaster or Telecaster, the Vox V222 Mark VI Teardrop guitar had a 25½" scale. The removable 22 fret neck featured a "C" profile, pearloid dot inlays and a zero fret. It was only ~1.6" wide at the nut and ~2" wide at the twelfth fret. Eko manufactured necks also featured an aluminum "double T" extrusion to resist twisting (see illustration at left). The truss adjustment was located at the base of the neck. The 1966 US Vox price list indicated that the retail price of the Mark VI guitar was $339.90 USD. Adjusting the 1966 price for inflation, the Mark VI would retail today for about $2295 USD. My thanks to Roger Tessier for not only allowing me to take photographs of his Vox Mark VI, but also for sharing his great wealth of knowledge about Vox guitars with the Vox Showroom. 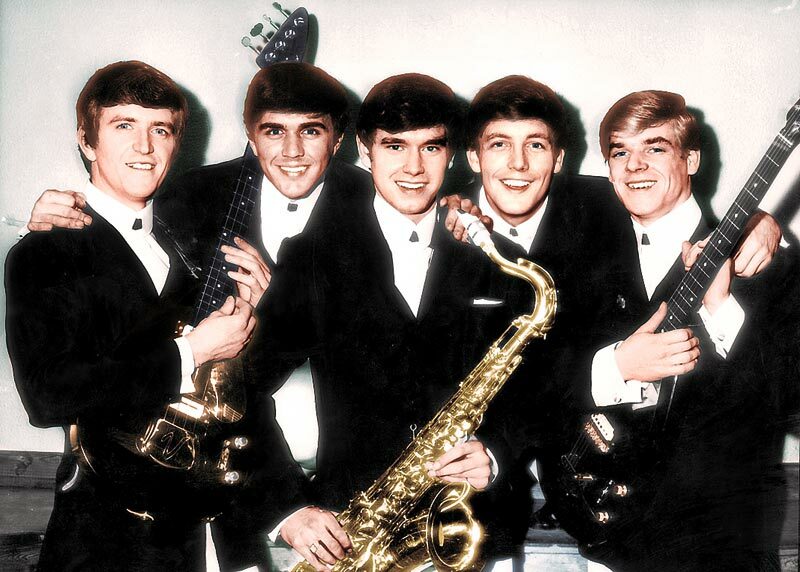 The Dave Clark Five with a black Vox Teardrop bass and a black Vox Teardrop guitar.